Insight Crime – a foundation dedicated to the study of organised crime. 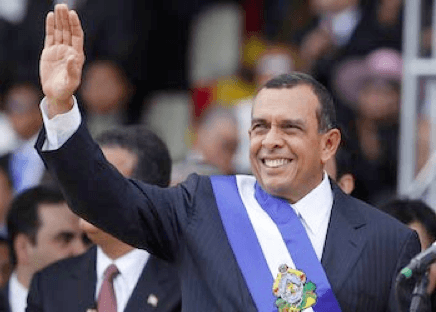 One of the leaders of Honduran drug trafficking network the Cachiros has testified in court that he repeatedly bribed former President Porfirio Lobo, adding to the evidence suggesting drug traffickers corrupted Honduras‘ state institutions at the highest levels. Testifying in the drug trafficking case of Lobo’s son Fabio, Devis Leonel Rivera Maradiaga told a New York court that he made his first payment of between $250,000 and $300,000 to Lobo when the politician was running for president in 2009, reported La Prensa. This was followed by at least two more bribes delivered directly to the president, Rivera said. The confessed drug trafficker testified that he later attended a meeting with Lobo after the election in which the president promised never to extradite Rivera and his associates and encouraged them to set up businesses that could be awarded government contracts, which they could then use to fund their political bribes. According to Rivera’s testimony, then-President Lobo placed his son Fabio in charge of coordinating with the traffickers. Rivera alleged that Fabio Lobo personally assisted with security arrangements for two especially large cocaine shipments, and that for one of those shipments, the younger Lobo charged an extra $50,000 to pay off ‘the boss’ — allegedly referring to current security minister and security advisor during the Lobo administration, retired General Julián Pacheco Tinoco. Rivera added that such political contacts, along with corrupt contacts in the police and military, helped the Cachiros establish themselves as one of Honduras‘ principal drug trafficking networks and move tons of cocaine through the country. In addition, Rivera testified about the 2009 murder of Julián Arístides González, then head of Honduras‘ Office to Fight Drug Trafficking (Dirección de Lucha Contra el Narcotráfico – DLCN). Rivera claimed he had attended a meeting with other traffickers and at least one current congressmen in which they decided to pay a group of policeman to assassinate Arístides. Porfirio Lobo fiercely denied all of the accusations, telling AFP he had never associated with or received any money from criminals. The Security Ministry also released a statement denying Rivera’s “ill-intentioned and baseless” accusations, which the ministry claimed he made in order to receive judicial benefits, reported El Heraldo. Rivera’s claims have yet to be independently verified, but they are not the first time Lobo has faced accusations of connections to organised crime. Last year, questions over Lobo’s murky ties surfaced after the emergence of a photo showing him with murdered crime boss José Natividad ‘Chepe’ Luna. While the guilt or innocence of major political figures such as those Rivera named remains undetermined, his allegations add to a growing body of evidence that makes it clear that the rise of networks such as the Cachiros and the increased importance of Honduras as a drug transit nation is directly connected to organised crime’s ability to co-opt and corrupt the country’s institutions. In addition, it is clear that this descent into security chaos coincided with the period following the 2009 coup against then Honduran President Manuel Zelaya, when Lobo and his political allies emerged as the country’s new rulers.